Stress and emotional pressures can throw you off-track, but you may feel compulsively driven to achieve your aims. Tailor your ambitions to fit your own needs. Careful evaluation of your health can bring problems to the surface which you're ready to resolve. Tiy a different approach to the way you handle stress, and forgive yourself for your own limitations. It's important to address your sexual needs, and deal with any inhibitions or fears that are blocking you. The Moon on the 3rd stimulates you to consider a different way of approaching your experience of partnership. You may want a more complete relationship, but before you transfer your discontent to your current situation, explore unresolved issues from the past. Your ability to see your situation clearly improves by the Moon on the 18th. Money matters can be complicated, especially joint finances. 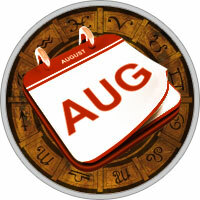 Mercury's retrograde from the 17th—31st brings a good period to review your finances and get everything back in order. Watch for opportunities that suddenly appear on the scene from the 22nd—27th. You could be left with the short straw, so invest only what you can afford to risk. Cut your losses, and try not to create new liabilities! It's easy to alienate influential people after the 16th. You may feel especially sensitive near the time of the Aquarius Moon on the 18th, yet this is a good time to talk about your feelings with a partner or good friend.